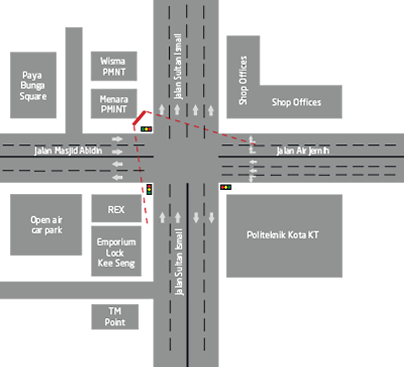 The screen is located at the busy traffic intersection of Jalan Sultan Ismail, Jalan Air Jernih & Jalan Masjid Abidin in the heart of KT city centre. Surrounding the screen is Payu Bunga Square, a new shopping mall which consists hotel & government offices as well as PMINT Tower which houses the Kuala Terengganu City Council & Terengganu State Economic Development Corporation. Major commercial banks branches such as Maybank, CIMB, Ambank, RHB Bank, Public Bank, Affin Bank, Bank Rakyat are also situated located along Jalan Sultan Ismail and the adjacent areas. © 2011-2018 PowerScreen Sdn. Bhd.